WORKS ON THE FOLLOWING All diesel 110, 115, 116, 123, 126, 201, and 124 chassis. 190D, 200D, 220D, 240D, 300D, 300CD, 300TD, 300SDL, 350SD, 350SDL, E300D. When it comes to diesel engine performance this is your best bang for the buck. I have seen this medicine work wonders on Mercedes diesels. Less smoke, better start, less injector nailing, better fuel economy, and more power are often the result. This Diesel Purge is a very high concentrate cleaner than is run through the engine directly from the can. It is not put in the fuel tank. It usually takes 15 to 25 minutes to run the entire can through the engine. In this kit I have provided the necessary hose and fitting along with 2 cans of Diesel Purge. 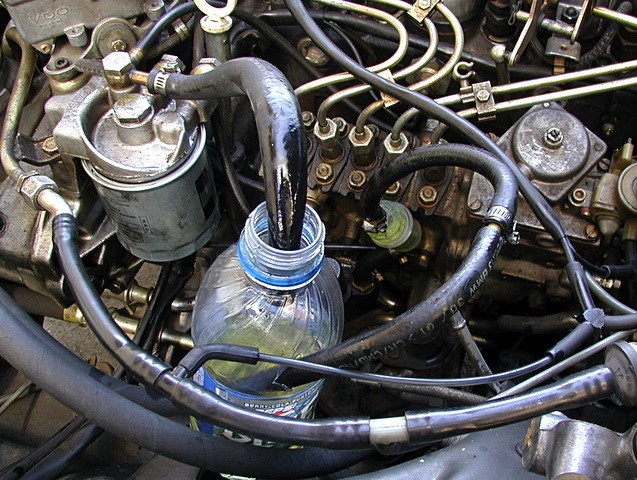 If your engine has been neglected you will want to run two cans through. Normal recommendation from my experience is one can every 6 months for peak performance. Complete instructions will come with the kit. PLEASE NOTE: The PDF instructions are specific to the 123 and 126 chassis engines up to 1985. We do not have specific fuel hose routing or plumbing instructions for models later than that. PLEASE NOTE: Plastic bottle does not come with my kit. Any one liter plastic drink bottle will work. You have to give this a try! The last time we did the purge on my sons 240D he could not believe the extra power going up hills. Please note: Diesel purge will not cure mechanically sick engines so I can not guarantee results. Complete picture instructions included with purchase. We also see Diesel Purge in an economical 6 pak without instructions.